So it turns out that lay ministry wasn’t invented in the 1970s, and certainly not by the Uniting Church in Australia. In this engrossing new book David Houston and his co-authors demonstrate several important, timely things. They show that the leadership of lay men and women has always been integral to the life and service of the churches that united in 1977. They show that it has never been about ‘filling in’ in the absence of those members who have been ordained into their ministries, still less about supplanting their role. Rather, there has always been a vital complementary between the ministries of those who have been ordained and the other members of the church. And they show that the importance of lay ministry and leadership has always stimulated innovation in the provision of educational resources for the people of God. 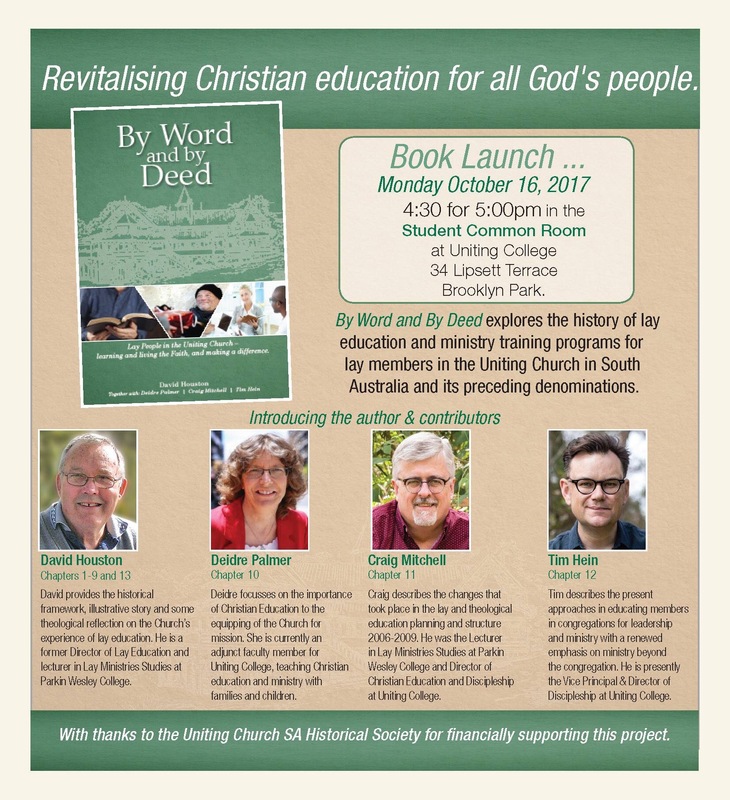 The account of this innovation becomes more finely grained as the book moves into the more recent work of the Lay Education Centre, Parkin-Wesley College and Uniting College for leadership & Theology. David Houston has also enlisted several of the recent Directors of this area of education to add to the narrative – Deidre Palmer, Craig Mitchell and Tim Hein. It has been my privilege to have been a colleague of each of these leaders (as well as David), and I encourage readers to pay attention to these experienced, wise, creative experts in Christian education and discipleship formation. In the Uniting Church’s Basis of Union, before anything is said about particular ministries or ordination, paragraph 13 affirms that “every member of the Church is engaged to confess Christ crucified and to be his faithful servant”. It celebrates the reality that “the one Spirit has endowed the members of Christ’s Church with a diversity of gifts, and that there is no gift without its corresponding service”. And it makes the commitment to “provide for the exercise by men and women of the gifts God bestows upon them” and to “order its life in response to God’s call to enter more fully into mission”. The beautifully expressed conviction of paragraph 13 is rightly celebrated in the Uniting Church as the mandate for the way we prioritise the diverse ministries of the whole people of God. But the stories of lay leadership and ministry collected in David Houston’s book show that paragraph 13 was not composed to express a new idea. Rather, it crystallised something which was already central to the Congregational, Methodist and Presbyterian churches – ensuring that it would continue to be central to the new movement they were forming, the Uniting Church in Australia. The Uniting Church believes that, at its core, the church is called into being as a body of many members with as many ministries as there are members. The church’s task in each and every faith community, therefore, is to discern and encourage that diversity of gifts for ministry and service. Moreover the task of each of the Uniting Church’s other regional councils (Presbytery, Synod and Assembly) is to fulfil its particular responsibilities in such a way as to establish the networks, systems and resources to equip and strengthen faith communities and their members for that kaleidoscope of ministry through which “Christ may work and bear witness to himself” (Basis of Union, paragraph 3). I commend this book wholeheartedly, and hope that it is widely read. The stories and analysis will inform us, certainly, but they will also inspire and encourage us to continue the story of missional discernment and innovation in our own generation and in our own spheres of responsibility and opportunity. Next Religion does more harm than good in the world. Agreed?